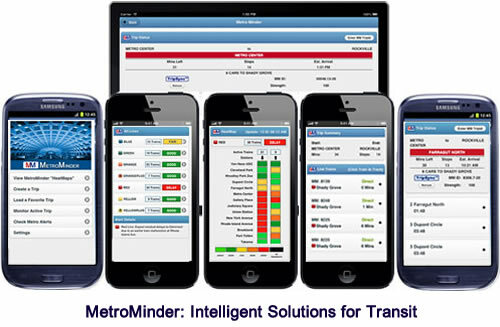 MetroMinder™ DC provides frequent riders of the Washington DC Metrorail system (Washington Metropolitan Area Transit Authority or WMATA) with an indispensible tool to track trips, plan commutes, and monitor train performance. MetroMinder DC tracks every active passenger train on the DC Metro system using raw data from WMATA's open API data source. 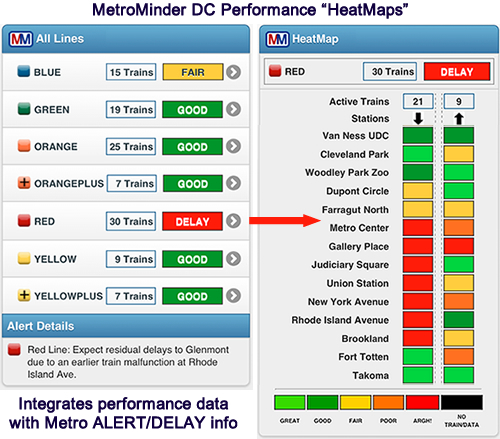 MetroMinder uses this and other derived data to organize and present information to better optimize and plan their commute. Easy access to key features from the Home Screen and using the "menu" icon on each screen. Visual displays showing “station-to-station” performance and the number of trains on each Metro Line (each direction). Visual displays showing the exact location of slowdows in each direction. Easy to see whether delays will impact the commute. Expanded train arrival data - at all stations - detailed data derived from MetroMinder's extensive train tracking process. • Identify delays before they become official ALERTs! • Better plan your commute! MetroMinder tracks every passenger train running on the DC Metro Rail system. This data is used to monitor Metro performance and generate “key performance indicators” (KPIs) to help riders better plan their commute. MetroMinder "HeatMaps" roll up all of this data into visual "HeatMap" display using a rating scale from "GREAT" to "ARGH!" This data is then trended/averaged over a rolling period and displayed graphically so riders can quickly understand/analyze information needed to plan their commute. MetroMinder lets you monitor your individual trip in realtime and receive regular updates on trip progress. Real-time trip tracking is managed on an external MetroMinder server so that tracking is not impacted if Internet is unavailable during the trip. During the trip, mobile devices talk to the MetroMinder server to maintain trip synchronization and obtain real-time updates. By tracking every active passenger train, MetroMinder provides much more data to help commuters plan their trips. 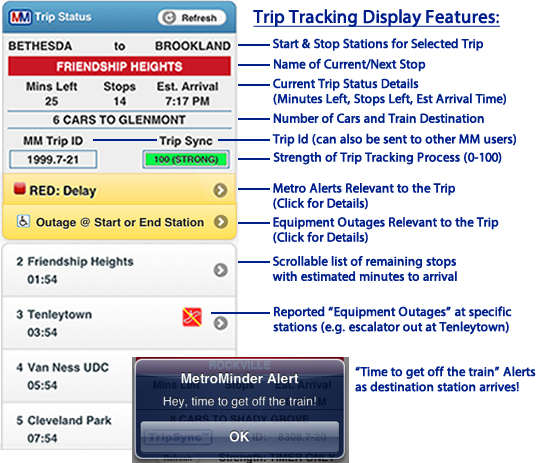 Since MetroMinder knows the details of the selected trip, it can display equipment outages and alerts (reported by Metro) that might effect the selected trip. This allows riders with "accessibility" needs to better plan their trips. Equipment Outage information is shown on the "station selection" screens (to help select an optimum station), train arrival/prediction screens, and on the trip tracking screens. By tracking every passenger train, MetroMinder can show train arrival prediction data for all trains currently tracked. This provides far more options (and trains) for riders to consider - again, helping to optimize the commute. 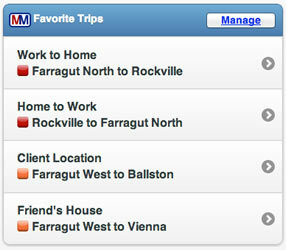 MetroMinder is able to present far more data than is available from other apps for from the Metro/WMATA website. Metro/WMATA “sign” data, WAMATA web site, and apps that directly use data from the Metro web site show a maximum of 3 trains in each direction and only trains that are within 20 minutes of arrival. MetroMinder shows ALL trains that are actively tracked by MetroMinder – providing far more useful data for the regular rider (see screen image to the right). It's widely known by regular riders that prediction data is very limited (if not unavailable) at end stations. By tracking every active passenger train, MetroMinder can present useful/derived arrival data for “end stations” - including the number of cars for the train (data not available from Metro or other apps) by deriving data from data processed on the MetroMinder TripSync Servers. MetroMinder filters prediction data and “alerts” and displays only data relevant to the selected trip thus simplifying displays and making it easier for riders to quickly obtain critical information. Filtered List of Arriving Trains - Only trains that move the rider toward the target trip destination are shown in the displays - eliminating trains going in the wrong direction that are not useful to the rider. Only Relevant Alerts Displayed – MetroMinder filters the alert information provided from Metro and displays only the alerts that are pertinent to the defined trip. Clicking on the alert message or from the home screen will retrieve a total list of current Alerts. Save/Load “Favorite” Trips - Users can save/load frequently used trips and name them whatever they like: “Home to Work,” “Work to Home,” or other names. Customizable Settings - Users can customize alert/notification information (app version only), allowing them to specify a unique reminder message, a preferred audio alert/sound, and the timing of alerts. Ability to Track Other Trips - Users can monitor any trip tracked by MM using the MM TripId. This makes it easier to meet up with a co-worker, spouse, or friend or be picked up at the destination station. Just give the MM TripId to the other user and they can monitor the trip using MetroMinder DC too! Rush Hour Plus - MetroMinder provides full support for Rush Hour Plus (RHP). All trains that move the rider toward the destination are included in arrival/prediction displays (with a special icon for RHP trains) along with a notation of whether the train would be a “Direct” trip or require a train “Transfer. 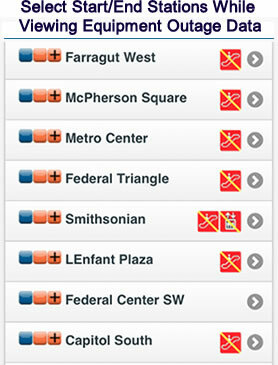 Multiple Platform Support – MetroMinder DC is available on Apple iPhone/iPad and Android Phones/tablets.